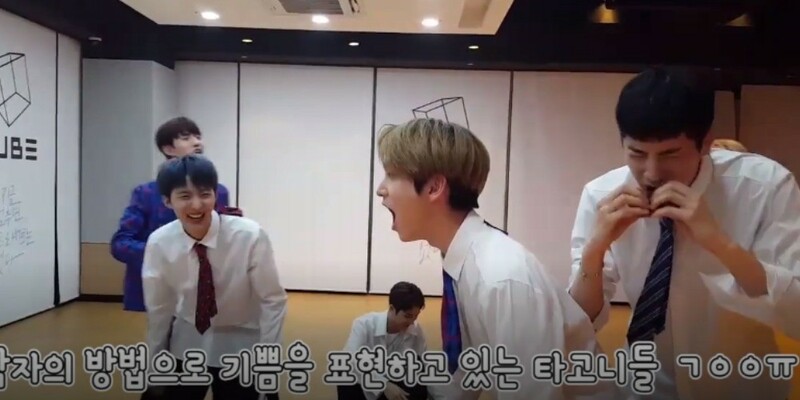 The members of Pentagon are beyond ecstatic at how they've finally entered the music charts. Recently, Pentagon's song "Shine" entered the 'Top 100' chart on Melon. This is the first time they've ever charted on a music chart. In celebration, Pentagon went live on Naver V app and also took the time to check the charts again during the live stream. After finding out that "Shine" was ranked #91 on the music chart, the members went wild -screaming, dancing, and running around. The members expressed appreciation and commented, "I'm so so grateful that we were called 'daesae' (trending star). It (being called a daesae) seems such like a high position to me and I'm so thankful that we were called that title." According to fans, "Shine" climbed up the charts even more after the V live broadcast and landed on #67. Later that night, the members started an audio V live at the miraculous hike in ranking. Kino reportedly said, "I am so happy. V app needs to be on for this. Wow..like did you see 67 next to Pentagon??" And he once again talked about how extremely happy he is to see their song on the chart. Fans are also deeply touched by Pentagon's achievement. Comments stated, "I'm getting teary. I'm just glad they are finally on the charts, even if they are ranking low on Top 100", "Seeing them so happy makes me more angry at Nilo. It's normal for hardworking kids like them to rise to the top. 'Shine's such a great song. I'm looking forward to more of their music." You can watch Pentagon's full celebration V live below.